Have you ever seen this before? You may frequently find hollow heart, internal black spot, net necrosis, or even brown center, but Blackheart is not found too often. This defect may exhibit no real symptoms externally, unless the black heart is in advanced stages and the tuber may feel a bit spongy, or there may be some gray to bluish gray discoloration showing on the surface. From Agricluture Hanbook Number 479; Blackheart occurs at any temperature when the supply of oxygen available to internal tissues is used up faster than it can be supplied. The affected tissue suffocates and turns black. 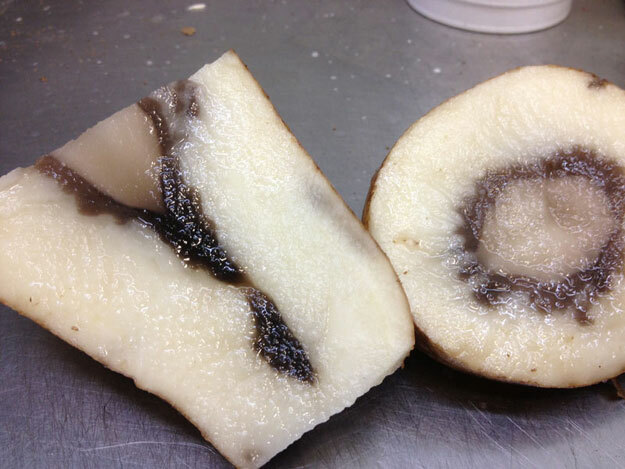 Conditions causing blackheart can occur in the field when the soil is flooded or soil temperatures are extremely high, in storage when aeration is poor, in transit when tubers are overheated, or in prolonged storage near freezing. When looking for this defect it is best to cut the tuber lengthwise (as shown on the left, in the image below), as you will be exposing the greatest amount of surface area to find this defect. The scoring guideline is specific and easy. If you see it, any amount at all, and you are sure it is blackheart, it is scored as a serious damage defect. There is no restricted tolerance for serious damage in the U.S. 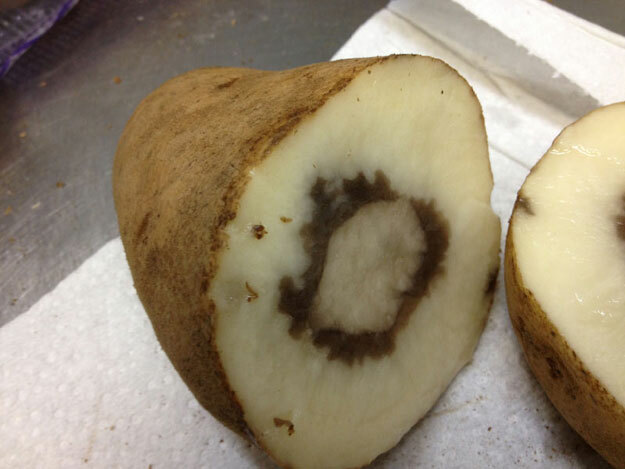 Potato Standard, so the blackheart would be scored as an internal condition defect, against the 7% tolerance for internal defects. have three questions for you. Scenario 1- Is in grade, as you have 5% internal defects (blackheart and internal black spot), and 4% external defects (black dot and soft rot, for a total of 9% defects. You are allowed 10% total defects. Scenario 2- Fails to grade, as you have 2% internal defects, and 8% external defects (fusarium and soft rot), and you are allowed no more than 7% external defects. Question 3- Soft rot is generally considered an external defect, unless in the unusual occurrence where it follows an internal defect, such as hollow heart.